Well, you set me quite a task as I had never used most of the tools required for that exercise – never even looked at some of those pallets in fact. But, I was determined as I could see value in the shapes being created so I pushed on and produced a reasonable facsimile of the blue chair. Mine is in tan leather but the details are quite similar. My beading on the two front panels needs a little more work to be perfect but I think I’ll leave it as it is. I certainly learned a lot and will put these new (new to me that is) tools to good use in the future. Thank you for giving me a push in the right direction. You got me out of my comfort zone and I learned something new and useful. Very much appreciated. Troy Design Media is an experienced 3D Visualisation company using formZ 3D modeller as well as Maxwell Render to produce the following great images. Troy has 15 + years of experience in architectural 3D visualisation with companies as large as Meriton Properties in Sydney, Brisbane and the Gold Coast to smaller bespoke design/visualisation projects. After spending 4 years at the University of Canberra studying Industrial Design full-time, Troy Bray his began working career as a technical illustrator with the NSW Fire Brigades for the Training Manual Project Team. Drawing became his unique passion and then his aspirations evolved which secured him a role with Meriton Apartments as a Graphic Designer. His duties included designing marketing collateral, in-house presentations and DA submission boards for all of their building projects. After 2 years with Meriton he then travelled abroad and supervised a team of ten architectural illustrators in China. As a team they secured international work supplied by developers for Commercial and Residential Building Developments. As Creative Director he instructed the team to produce world class illustration and marketing collateral for their clients across the globe. His time in China was productive and cemented his position in the architectural industry. After returning to Australia, Troy grew a Freelance business over the next ten years securing work all over Sydney. As a part – time endeavour Troy taught his design expertise at Enmore Design College to the Design and Entertainment students using packages in Adobe Creative Suite and Form Z – 3D. During his time as a freelancer he has designed a number of retail outlets including a Dessert Shop, Beauty Salons and a number of office fit outs. His latest interest which spans outside of the architectural industry includes Game Design for mobile and tablet devices. He continues his pursuit in the architectural design industry offering first class solutions to complex problems and is always available for suitable positions that are of significant interest. Here are just a couple of examples using formZ 8.5 and Maxwell Render 3.2.
dacode – a Melbourne based 3D specialist company: dacode imaging with Maxwell Render has excelled in producing some of the best 3D images for architects Internationally and Australia wide. The following images are some recent examples that have all been created for clients using formZ 8.5 for 3D modelling and then using Maxwell Render v3.2 either via the formZ /Maxwell plugin or via Maxwell Render Studio, where there, in some cases has been some additional modelling imported in other formats for enhancing reality. Maxwell Render offer unbiased realistic rendering that is fast to set up and produces arguable the best 3D rendering results available – no compromises. When we were considering the introduction of form•Z free as a reduced version of form•Z, our expectation was that it would popularize 3D modeling even among lower and middle school students. To our delight it is working great as a general introductory modeler and it is proving especially effective in the newly popular area of digital fabrication. Here is the story at one of the highly ranked design schools. form•Z has been an integral part of the design curriculum at The Minneapolis College of Art and Design (MCAD) for many years. Professor Brad Jirka recently provided very insightful feedback on how MCAD has integrated form•Z. Using two levels of form•Z applications, form•Zquickly and seamlessly produces exceptional results with the latest fabrication and 3D printing technology. Add a new unique twist to your 3D design using the generative tools in form•Z as we demonstrate the Voronoi diagram, Delaunay triangulation, point scatter, surface scatter, volume scatter, wrap and parametric map modeling tools. These tools have practical and theoretical applications in a large number of science and technology fields and have very desirable artistic characteristics. We’ll see how they can be used together along with other form•Z tools to generate complex organic forms and design structures in a fun and intuitive way. You’ll also see how these forms are fabrication ready such as 3D printing. Any design professional who wants to enhance their design to include a variety of spawning, scattering, cell diagram and parametric map based form generation will be interested in this topic. form·Z Online Training Online training classes are a great way to learn form•Z from the convenience of your computer. Online sessions follow a structured class plan and often include downloadable guides and sample files that complement the training. Class sizes are limited to keep the course moving and make sure that everyone is able to follow the presentation. Most classes have Q & A time block at the end to allow for specific questions and feedback. Classes are conducted at a variety of times and and cover a variety of subjects. Trial versions of form·Z Try form•Z pro 8.5 or form•Z jr 8.5 for 30 days for free! These trial versions are fully featured software including an unlimited number of saves and the ability to import and export from any of the supported file formats. form·Z Student Edition The form•Z Student Edition is free for students and faculty for academic use. FormZ 7 has arrived and Smart Technology is providing an easy upgrade path for existing users of formZ or users of bonZai3D to upgrade. FormZ offers a form generating environment much more powerful, dynamic, intelligent, yet easier to use than any of its previous editions. Not only can you build any form you imagine with formZ, it can also ignite discoveries of forms that you may not have thought of otherwise. You start with a smart interface that senses what you intend to do and protects you from unwanted actions. This includes automatic picking and automatic guides that assist you in drawing accurately. Fully parametric and dynamic generation of 3D formsthat can be further manipulated at any time after their initial generation. 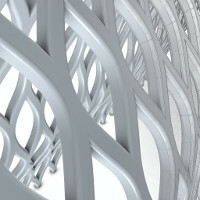 A Reshape tool that, by capitalizing on real time Boolean operations, offers more sculpting actions that produce robust solid models that can easily be fabricated. Powerful formula tools create complex curves and surfaces based on mathematical formulas with ease. The included predefined library of shapes is a launching point for a whole new method of form creation. Components are enhanced symbols that include the ability to edit the component directly where it is placed. Components are also embedded in project’s making them less dependant on external library files. The complete interface and the tool palettes are fully customizable, including the newly introduced favorites palette, where you may place the tools you use frequently for instant access. Newly introduced workspaces group related tools and palettes together making it easy to switch between tasks. User defined workspaces allow for creation of custom workspaces. The traditional formZ drafting and modeling environments found in previous versions have been merged combining the power of both in a unified environment. This powerful combination yields long desired features such as dimensions, hatching and line styles to 3D. Layout sheets can be used to compose different views of a model and/or sections and/ or construction details together with notes and dimensions and have it printed to send to the construction site. The modeling interface has been enhanced with a new shaded working environment. Traditional wire frame, hidden line, shaded full and doodle rendering are included. Photorealistic, global Illumination and sketch rendering is available with the optional RenderZone plugin. Dynamic clipping planes allow for non-destructive cutting of models. This real-time dynamic interface allows for complete inspection of a design. The new Sun Palette enables the quick evaluation of natural light in a building on any given day or time. Quickly create animation of the sun light through a day or an entire year. Present your designs interactively on line with the new VR creation features. These allow you to create web ready interactive panoramic and 360 object movies of your design. Interoperability, a traditional strength of formZ, has further been enhanced with updated translators and a new Rhino import feature. Models can be animated within formZ to produce movies for presentation purposes. Or they can be fabricated using any of the contemporary 3D Printing, Rapid Prototyping, CNC, or Milling machines. Come ride along with us! Watch and learn formZ anytime, at your leaisure. Click HERE to select a session to familiarize yourself and master the tools at your command! form•Z Users on the family plan and those that have purchased formZ 6.7 recently qualify for an automatic upgrade to form•Z 7. Instructions on how to download your software along with new installation codes will be emailed to you shortly. If you are interested in purchasing an upgrade please visit the Smarttec purchase page here or contact sales@smarttec.com.au and for those that BUY or upgrade before August 31 and use the Voucher code ‘formz7‘ at checkout will get a 10% discount. Image Credits: Formula Surface and Faucet Blend, by Matthew Holewinski; Taiwan DayformZ Interface and Mongol Junk, by John Alexander; Willow2D to 3D, by Matthew Holewinski; Metro Train, by Matthew Holewinski. A tram overpass in Adelaide had been stalled for a year. Why? Because the community couldn’t visualise the impact of the new overpass on their environment, and therefore wouldn’t support the project. 3d Rendering, endless expensive photoshopped drawings, handsome architectural sketches and engineering plans – all to no avail as the social license was withheld. Winning the ambiguous and unofficial ‘social license’ can be as important as the environmental, safety and functionality conditions in many projects. And sometimes it is even more important. When it goes wrong, and you’re unable to get the social license, we see an increase in complaints and projects stalled. The bigger the community dissatisfaction, the more intense the reactions become – to the point of people marching in the streets. The fear of community anxiety, resistance to change, and backlash has been noted in recent COAG cities reports as an inhibitor to some projects. Even though the projects may be critical for productivity and urban quality, they are just too hard to get off the ground. Public servants also want to avoid unhappy communities and stakeholders. It is the bureaucrat who receives the complaints from ministers and mayors, and is asked to respond promptly. Each response can take many days, as they try to explain how the situation will exactly play out from the objector’s viewpoint. This can be tedious and unsatisfactory work. Our educated population wants to know what is going on in their environment, and they expect best practice. This is not just a NIMBY (“not in my backyard”) phenomena – it is a growing social conscience of what is good planning and design, and outcomes for the city, state or locality. And why should the population trust the ‘experts’? Poorly-executed buildings and infrastructure have depressed areas for generations, created ghettos, encouraged crime, and even caused deaths. Over the last 50 years we’ve seen trams removed from cities, a failure in social housing, riversides destroyed by roadways, and a mentality of the city as a machine. As our population ages, and if they ever get to retire, the ‘non-experts’ (residents) will become even more engaged in projects, planning and design in their vicinity. Therefore, in future, we can expect the social license to be even harder to win, and the bar to rise. Perhaps this is an opportunity for crowd-sourcing in city planning. But how do you gain the social license from a community? Often we see the engineer personality at community events with impenetrable plans and an inability to socially engage, the architect defending the glory of their monument from selected viewpoints, and the army of wordsmiths with a pile of reports and brochures. There is often a complete lack of trust, and sometimes of respect, between communities and experts. We all know how much the information is presented in its ‘best light’ – the 50 revisions of the brochure full of weasel words. One of the keys is to enable complete, open transparency. To allow people to see how a new project will directly influence their life and environment. And to do this in the most easy way. Why should it be hard? Why should they need to sift through hundreds of pages or assimilate abstract drawings in their head? They want to know – how will this new road look from my back door? How will it affect the sidewalk, or the park where I walk my dog? What if it rains? How does it integrate with other facilities? Will it add or remove value for the local area? Will my neighbourhood be better for the change? In order to win the social license, you need the community and the stakeholders to be convinced that they are completely aware of the environmental change – from every experience and perspective of interest. When we provide full visibility, even when the most drastic changes are being proposed to people’s previously sedentary life, people buy-in to the project. Take away the razzle dazzle of the over-manipulated information, and make it open and immersive. And remove the need to convert and interpret abstract plans and drawings. Across thousands of experiences with community members and other stakeholders, including industry professionals, we see the light bulb go on, anxiety and worry vanish and the immediate realisation of understanding. People despise not being able to understand something – it makes them anxious. So the sooner you can truly create understanding, the sooner you can win the social license. When projects and plans are transparently revealed in a simple and easy manner in a virtual replication, anxieties are eliminated, people become calm, and objectors become evangelists. Residents aren’t intentionally hindering your work – they just need to understand. And the easiest way to do this is through seeing how all the pieces fit together, clearly and simply. I have had a bit of a look around the forum and documentation, also downloaded the trial version of Bonzai and have only one burning question; Is there a viable way of creating construction drawings (for houses) that remains linked like they do in SU Pro? I notice that alot of users are exporting to Revit for this stage, but it doesn’t solve the problem with the drawings being divorced from the original model. Bonzai3d is designed as a 3d modeling program, and it can generate plans and sections that can be exported in 2d (or 3d) to a dedicated drafting program — such as AutoCAD, Archicad, Vectorworks, etc. As you note, this can require extra steps if there will be multiple revisions, and we are currently working on the Drafting Environment for formZ 7 — which will integrate the model with the documentation as you are requesting. Right now, the Drafting Workspace is a bit of a work in progress, but Hatches have just been released, and soon Line Styles & Weights will be implemented — along with the full Layout Environment so that you can create full blown construction documents. And — if you make a change to the model, the documentation will be updated automatically. I haven’t test driven formz yet, it sound cool to have the bonzai features in it too. Is it possible to purchase bonzai and upgrade it later to the full formz program? Or perhaps buy the 2D drafting/ plotting environment as an add on? Anyway, that does answer the initial question. sorry to add more 🙂 I’ll have a look at the beta version, thanks. We are not sure if we will be adding a 2d add-on for bonzai3d in the long run — but it will not be available in the near future. If you know you will want integrated Drafting (beyond basic notes and dimensions), you should most likely choose formZ over bonzai3d. Ok, that makes sense. Had a bit of a play today with Beta 7, love the roof building tool! Love the way the drafting tool set can be selected easily, and the quality of the icons and descriptions is fantastic, great work. So I’m thinking the best option would be to buy bonzai3d now (so I can start learning the tools etc), and upgrade when fomZ 7 is released…anyway, sounds good either way.